Phoebe had never met West Ravenel, but she knew one thing for certain: He was a mean, rotten bully. She had known it since the age of eight, when her best friend Henry started writing to her from boarding school. West Ravenel had been a frequent subject of Henry’s letters. He was a big, sarcastic, hardened case of a boy, but his constant misbehavior had been overlooked, as it was in nearly any boarding school of the time. It was seen as inevitable that older boys would dominate and browbeat younger boys, and anyone who dared tell tales would be severely punished. I thought it would be fun to go to bording school with other boys, but it’s not. There’s a boy named West who always takes my breakfast roll and he’s already the size of an elefant. Yesterday it was my job to change the candlestiks. West Ravenel sneaked trick candles into my basket and last night one of them went off like a rocket and singed Mr. Farthing’s brows. I got my hand caned for it. Mr. Farthing should have known I wouldn’t have done something so obvyus. West isn’t a bit sorry. He said he can’t help it if the teacher is an idyut. I drew this picture of West Ravenel for you, so if you ever see him, you’ll know to run away. I’m bad at drawing, which is why he looks like a pirate clown. He also acts like one. For four years, West Ravenel had annoyed and plagued poor Henry, Lord Clare, a small and slight boy with a delicate constitution. Eventually Henry’s family had withdrawn him from school and brought him back to live in Heron’s Point, not far from where Phoebe’s family resided. The mild, healthful climate of the coastal resort town, and its famed seawater bathing, had helped to restore Henry’s health and good spirits. To Phoebe’s delight, Henry had visited her home often, and had even studied with her brothers and their tutor. His intelligence, wit, and endearing eccentricities had made him a favorite with the Challon family. She had needed a husband who could also be a friend, and Henry was her best friend in the world. He understood everything about her, just as she did him. They were a perfect match. Phoebe had been the first one to broach the subject of marriage. However, she’d been stunned and hurt when Henry had gently tried to dissuade her. Henry had gone into his final decline a year ago, just before birth of their second son, Stephen. In the months of grief and despair that had followed, Phoebe had gone to live with her family, finding a measure of solace in the loving home of her childhood. But now that the initial year of mourning had passed, it was time to start a new life as a young mother of two boys. A life without Henry. How strange that seemed. She would have to move back to the Clare estate in Essex—which Justin would inherit when he came of age—and she would try to raise her sons the way their beloved father would have wished. Knots of dread tightened in Phoebe’s stomach as the carriage rolled toward the ancient estate of Eversby Priory. This was the first event she had attended since Henry’s death. Even knowing she would be among friends and relations, she was nervous. But there was another reason she was so thoroughly unsettled. Gabriel was betrothed to a lovely and unique girl, Lady Pandora Ravenel, who seemed to adore him every bit as much as he did her. It was easy to like Pandora, who was outspoken and funny, and imaginative. In fact, Phoebe had found herself liking the other Ravenels she’d met, when they’d come to visit her family’s seaside home. There was Pandora and her twin sister Cassandra, and their distant cousin, Devon Ravenel, who had inherited the earldom recently. His wife, Kathleen, was friendly and charming. Had the family stopped there, all would have been well. But Fate had turned out to have a malicious sense of humor: Pandora’s distant cousin Devon’s younger brother was none other than West Ravenel. West lived on the estate, no doubt puttering about and pretending to be busy while sponging off his older brother’s inheritance. Recalling Henry’s descriptions of the big lazy sloth, Phoebe envisioned West drinking and laying abed until noon, and leering at the housemaids as they cleaned up after him. It didn’t seem fair that someone as good and kind as Henry should have been given so few years, when a cretin like West Ravenel would probably live to be a hundred. “Mama, why do you look cross?” her son Justin asked innocently from the opposite carriage seat. The elderly nanny beside him had leaned back to doze in the corner. Kneeling up on the carriage seat, the child stared at the ancient Jacobean mansion in the near distance. Once the fortified home of a dozen monks, the huge, highly ornamented structure bristled with rows of slender chimneys. It was earthbound, stocky, but it reaching for the sky at the same time. “It’s big,” Justin said in awe. “The roof is big, the trees are big, the gardens are big, the hedges are big . . . what if I get lost?” He didn’t sound worried, however, only intrigued. Justin’s skeptical gaze went to the dozing elderly nanny, and his lips curled in an impish grin as he looked back at Phoebe. The caravan of fine carriages progressed along the drive, conveying the entourage of Challons and their servants, as well as a mountain of leather-bound bags and trunks. The estate grounds, like the surrounding farmland, were beautifully maintained, with deep mature hedges, and old stone walls covered with climbing roses and soft fluttery bursts of purple wisteria. Jessamine and honeysuckle perfumed the air as the carriages came to a slow halt in front of the portico. Nanny awoke from her light snooze with a start, and began to gather little odds and ends into her carpet bag. She took Stephen from Phoebe, who followed Justin as he bounded out. “Justin . . .” Phoebe said uneasily, watching him dart through the mass of servants and family members like a hummingbird, chirping little hellos. She saw the familiar figures of Devon and Kathleen Ravenel—Lord and Lady Trenear—welcoming the arriving guests. There were her parents, and her younger sister Seraphina and their brother Ivo, and Pandora and Cassandra, and a dozen people she didn’t recognize. Everyone was laughing and talking, animated by the excitement of the wedding. A shrinking feeling came over Phoebe at the thought of meeting strangers and making conversation. Sparkling repartee wasn’t even a possibility. If only she were still dressed in protective mourning, with a veil concealing her face. In the periphery of her vision, she saw Justin trotting up the front steps, unaccompanied. Aware of Nanny starting forward, Phoebe touched her arm lightly. “I’ll run after him,” she murmured. The entrance hall was busy, but it was still calmer and quieter than outside. A man directed the tumult of activity, giving curt instructions to passing servants. His hair, a shade of brown so dark it could easily have been mistaken for black, gleamed like liquid as the light moved over it. The man listened closely to an issue the housekeeper was explaining about the arrangement of bedrooms. Simultaneously he tossed a key to an approaching under-butler, who caught it with a raised hand and dashed off on some errand. The stranger radiated a sort of contained vigor that Phoebe found striking. He didn’t have the relaxed, languid manner of a gentleman. He was well-dressed in simple, expertly tailored clothes, not livery. Perhaps he was an estate manager? But his complexion was the glowing golden-brown of someone who labored in the sun. How curious. Justin had ventured to the side of the grand staircase to investigate the elaborate wood carving at the base of the balustrade. Phoebe went to him quickly. “Justin, you mustn’t wander off without telling me or Nanny,” she whispered. Her gaze followed the direction of his small forefinger. She saw a carving of a little nest of mice, a playful and unexpected touch amid the grandeur of the staircase. As Justin crouched to stare at the carving more closely, a glass marble dropped out of his pocket and hit the inlaid parquet floor. Dismayed, Phoebe and Justin watched the little glass sphere roll away rapidly. But its momentum was brought to an abrupt halt as the dark-haired man pinned it with the tip of his shoe in an impressive display of timing. Finishing his conversation, he bent to pick up the marble. As the housekeeper bustled away, the man turned his attention to Phoebe and Justin. His eyes were shockingly blue in that sun-tanned face, the brief smile a dazzling flash of white. He was very handsome, his features strong and even, with faint, pale whisks of laugh lines radiating from the outer corners of his eyes. He seemed like someone who would be irreverent and amusing, but there was also something shrewd about him, something a bit flinty. As if he’d had his share of experience in the world, and had few illusions left. Somehow that made him even more attractive. He approached without haste, moving with athletic ease. It was only when he stopped next to them that Phoebe realized how very tall he was, his shoulders broad and sturdy. Her lungs contracted, forcing her to take an extra breath. The strangest feeling came over her, something that reminded her a little of the early days of her marriage to Henry . . . that shaky, embarrassing, inexplicable desire to press her body intimately against someone else’s. Until now, she’d never felt it for anyone but Henry, and never anything like this fire-and-ice jolt of awareness. Feeling guilty and confused, Phoebe backed away a step, pulling Justin with her. Phoebe felt a brilliant pink flush, never flattering on a redhead, race from her scalp down to her toes. The man wasn’t a bit flustered, only sank to his haunches to bring his face level with Justin’s. His voice was gentle and low, and made Phoebe feel as if she were stretching across a deep feather mattress. “I lost my father when I wasn’t much older than you,” he said to Justin. Phoebe was mortified by her inability to reply. Her heartbeat was stampeding out of control. Phoebe found herself smiling up at him as he stood to face her. “You’re the estate manager?” she asked. A strange, terrible suspicion flickered through Phoebe’s mind. “How long have you been employed here?” she asked cautiously. 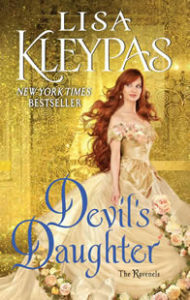 “Historical romance goddess Lisa Kleypas lets worlds collide with her newest entry in the Ravenels series, bringing the characters of her Wallflowers series, specifically fan favorite Sebastian, Lord St. Vincent, back to play. . .